Evolutionary psychology has always had a polarising influence. Advocates see it as potentially unifying, not only of the disparate subfields of psychology, but also of all the human sciences. A transformative and unifying theoretical framework. Detractors perceive it as politically and scientifically suspect, built on a mix of rebranded genetic determinism and just-so story telling. An arid desert, devoid of social and cultural considerations. 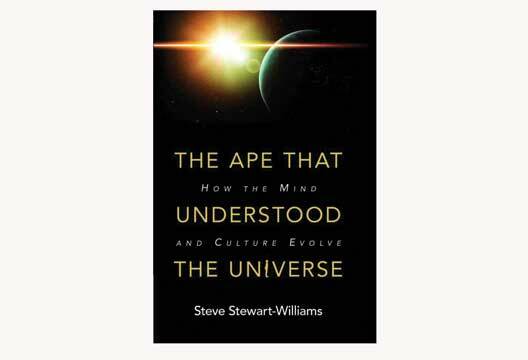 In The Ape that Understood the Universe Steve Stewart-Williams demonstrates just how important the concept of cultural evolution has become to the burgeoning field of evolutionary psychology. The subtitle How the Mind and Culture Evolve makes this explicit. As a writer and editor of evolutionary psychology books, I am always keen to get my hands on the competition as it appears. My response to Stewart-Williams’s book was ‘Damn, this is good!’ Frankly, whether you are advocate or detractor you should acquaint yourself with this book – love it or loathe it you will learn a lot from reading it. And you will find that reading to be a captivating, page-turning, voyage of discovery. Stewart-Williams is not only an experienced evolutionary psychologist but also a talented and insightful writer with a memorable turn of phrase. The Ape that Understood the Universe begins with how an asexual alien might report back on human social behaviour, demonstrating, when we look at ourselves from a different perspective, just how odd our behaviour can appear. Similarities and difference between us and other animals are laid out in order to later explore where both arise from. For example, whereas human males have a lower threshold for physical aggression than females (the norm among mammals) human males also engage in high levels of parental care (almost unheard of in other mammals where the males are largely ‘sperm-donors’). This raises the important question – how might we account for both similarities and differences? Of course, this is a device to draw the reader in, as such features of human behaviour are explored in later chapters. This is not the first time I have come across this alien perspective device, but Stewart-Williams does it particularly well, making it feel fresh. From here, through five further chapters, we are asked to consider the relationship between natural selection and behaviour and then sexual selection and relationships, followed by considerations of the whys and wherefores of altruism and finally to explore the current standing of cultural evolutionary theory. Although he covers much of the ground that many introductions to the relationship between evolution and behaviour have previously considered, Stewart-Williams’s constant playful use of metaphor, anecdote and witty aside maintain the reader’s attention throughout. In reading it myself, I regularly thought, ‘I know this stuff, it’s my bread and butter (not to mention my obsession), and yet I can’t wait to see where this narrative is going.’ Importantly, you don’t have to have foreknowledge of the subject area in order to comprehend this book. Despite covering a great deal of ground, due to its accessible and engaging language, it is easy to follow for the non-specialist. In addition to these six chapters, Stewart-Williams provides two very useful appendices. ‘How to win an argument with a Blank Slater’ is particularly enlightening (and entertaining). To be sure there are areas where evolutionary psychology is open to fair and reasonable criticism. I have my own doubts about some evolutionists’ use of ‘massive modularity’. But here Stewart-Williams shows how lazy criticism made by those who just don’t like the idea of evolutionary psychology, but clearly haven’t done their homework, can easily be dispatched. Examples of this include why evolutionary psychology isn’t genetic determinism (no serious evolutionist has been a genetic determinist for over half a century) and why the accusation of just-so story telling fails, since all hypotheses are just-so stories until they have been tested. And hypothesis testing forms the bedrock of evolutionary psychology today. ‘How to win an argument with an anti-Memeticist’ is also entertaining, but I must confess that I’m not a dyed-in-the-wool memeticist. So in this case I have some sympathy for at least some of the critics. Then again, evolutionary psychology would not have progressed to its current standing without a degree of diverse opinion. In summary, I would agree with the second-rate evolutionary psychologist who declared on the back cover that The Ape that Understood the Universe is ‘a twenty-first century successor to The Selfish Gene’. - Lance Workman is Visiting Professor in Psychology and a ‘second-rate evolutionary psychologist’ at the University of South Wales.